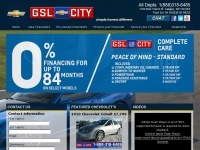 GSL Chevrolet Calgary will meet all of your Chevrolet needs in Calgary. We have been proud to serve Southern Alberta for all of its New and Used Chevrolet purchases along with parts and service. For more information on GSL please call us at 1-888-318-6485. The websites creator or author is GSL GM City. Copyright GSL GM City. All rights reserved is the owner of the copyright for this website. 3 links pointing to Calgarychevrolet.ca were found. Individual words like Chevrolet and Calgary are frequently used in text links from other websites. The most important links to the website are from Calgarybuick.ca and Calgarygmc.ca. The homepage of Calgarychevrolet.ca and the subsite are most referenced by other websites. The table shows the most important links to Calgarychevrolet.ca. The table is sorted in descending order by importance. The table shows websites of Calgarychevrolet.ca, which are often linked by other websites and therefore they are classified as important content. The web server used by Calgarychevrolet.ca is located in Scottsdale, USA and is run by GoDaddy.com, LLC. There are many websites run by this web server. The operator uses this server for many hosting clients. In total there are at least 284 websites on this server. The language of these websites is mostly english. Only a few websites on this web server are x-rated. A Apache server hosts the websites of Calgarychevrolet.ca. The website uses the latest markup standard HTML 5. To analyze the visitors, the websites uses the analysis software Google Analytics. Indexing the data of the website and following hyperlinks on it is explicitly allowed by robot information.